DEJOU gathers your personal information to provide optimized and customized services for you. However, personal information which may be taken infringe on basic human rights such as: race and ethnicity, ideology and creed, place of birth, political affiliation, criminal record, health status, and etcs will not be collected. Your personal information will be disposed of once the purpose of collection has been achieved. However, personal information may be retained for a certain period of time in accordance with the provisions of the Commercial Code and other relevant laws and regulations related to trade rights and obligations. - Disclosure of personal information is needed in order to protect against harm to the rights, property or safety of Dazecompany(Inc.) and our users as required or permitted by law. For the customs purposes, company will collect member's identity information when shipping process begins. This information will be kept and used for a month, once shipping process is completed. For the customs purposes, collected information may be provided to following consignment companies. - Information's Collection and Usage Period : 1 month after shipping process is completed. For the international billing purposes, collected information may be provided to following payment gateway companies. - Information's Collection and Usage Period : T&Cs may vary depending on services. ※ Without your agreement for providing identity information, we will not be able to process international shipping and billing to designated country. At DEJOU, even non-members can purchase items and service goods. Dazecompany(Inc.) requests for personal information needed for delivery, payment, and shipping from Non-member customers. Non-members’ personal information such as name of payer and recipient is used only for payment and shipping purposes. At DEJOU, even non-members can purchase items and service goods. DEJOU requests for personal information needed for delivery, payment, order status, purchase confirmation, and name verification. In DEJOU, Non-members’ personal information such as name of payer and recipient is used only for payment and shipping purposes. DEJOU's non-members personal information is protected to the same degree as to our members. You can access or update your personal information through the “Membership Information” menu and you can withdraw from membership by sending your request to Customers’ Feedback. When updating personal information, we may ask you to verify your identity before we can act on the request. Your ID and password can only be used by you and none other. If it has been found that the problem did not occur due to DEJOU's negligence or mistake, DEJOU will not be held responsible for problems that arise due to misuse or illegal use of your ID and password by a third party. Do not share your password to a third party or leave your account logged in. Do not forget to log out after using a computer in a public place where others may use the computer after you. DEJOU will take measures to make it easier to withdraw consent (membership cancellation) for collection of personal information than it is to gather personal information. DEJOU uses server and network equipped with state-of –the-art security system. DEJOU has its own firewall to give full protection for your personal information. 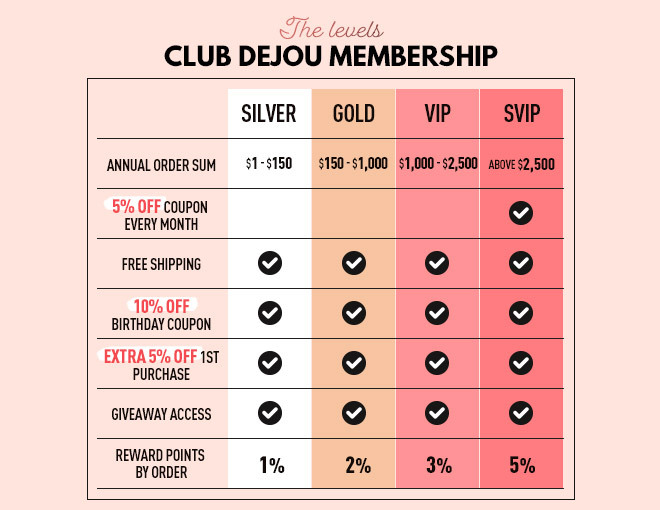 In DEJOU, even non-members can purchase items and service goods. DEJOU request for personal information needed for delivery, payment, and shipping fee is requested from Non-member customers. Non-members’ personal information such as the name of payer and recipient is used only for payment and shipping purposes. DEJOU’s non-members personal information is protected to the same degree as to our members.